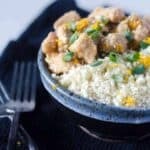 If you’re completely intimidated by your Instant Pot, this Sesame Orange Chicken is the perfect recipe for you. It just has SO MANY BUTTONS. For the first six months I had it, I only cooked sweet potatoes (1/4 c. water per potato, 12-14 minutes, high pressure, natural release) and eggs (1 dozen, 1 cup of water, 4 minutes, low pressure, quick release). Those were the only two things that I knew well and knew I could get right every time. 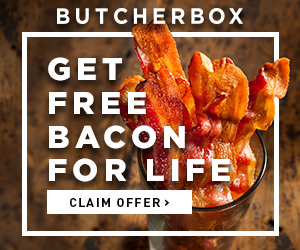 Because lets be honest – no one wants to cook a meal and have it be a total bust. Then you’ve wasted the ingredients and you still don’t have dinner. Fail. Just recently, in the interest of saving time, I’ve started venturing out with my Instant Pot recipes. I tested out and then included Instant Pot instructions for my Pumpkin Turkey Chili, and although I haven’t had a chance to verify them myself yet, I’ve seen others try my Buffalo Chicken Casserole in the Instant Pot as well. Brandan is always asking me to make more asian food. I’m not sure why I don’t – I guess I just don’t think about it when I’m contemplating recipe ideas. 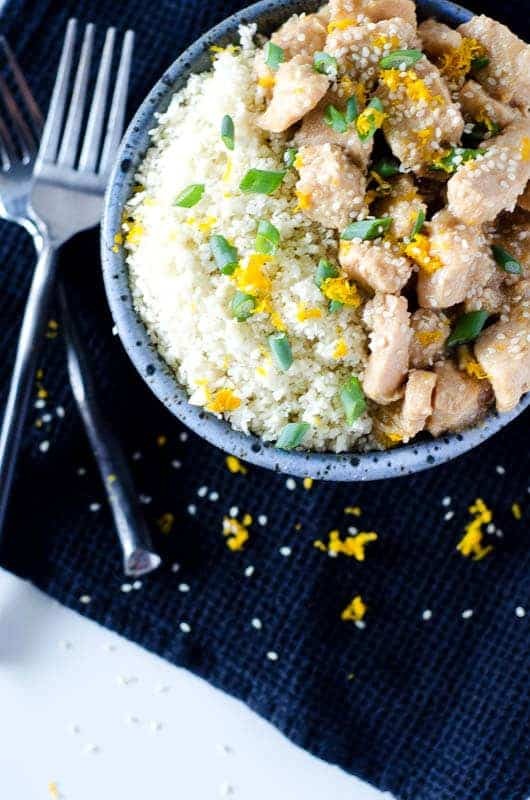 But he’s right – they’ve typically got tons of flavor and are easy to convert to paleo, so I decided to give it a go with some orange chicken in the Instant Pot. This Sesame Orange Chicken is my first attempt at creating an Instant Pot recipe from scratch, though. And imma tell you something – the IP might just be my new love. Here’s the beauty of it – it does everything in one pot. You brown your meat on the sauté function, then switch functions for pressure, add your sauce, and walk away for a bit. I ain’t got time for playin, I’m just saying man/we out here tryna function, man we out here tryna function. No pan to watch on the stove, no eight hours of planning ahead. Like I said – easy peasy orange chicken squeezy. (Don’t actually squeeze your chicken. That would be weird.) For reals, though. Cut up your chicken and your onion, mix up your sauce, and you can have dinner on the table in half an hour. If you’re still scared of your Instant Pot, don’t be. This recipe will make you Instant Friends. A quick and easy instant pot recipe! 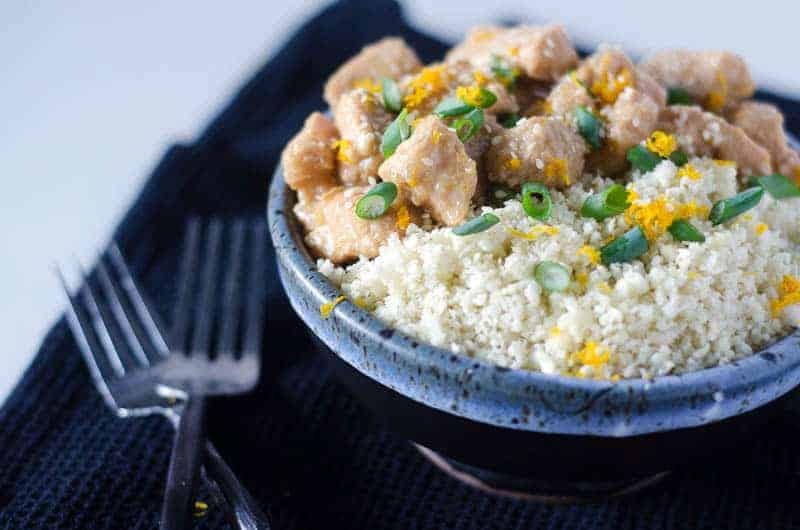 Orange chicken meets a hint of spice and is ready in 30 minutes. Cut chicken breasts into bite size pieces and set aside. In a bowl, combine the chiles, orange juice, coconut aminos, fish sauce, minced garlic, minced ginger, and orange zest and whisk to combine. Set your Instant Pot to sauté and add the toasted sesame oil to the pot. Once the oil is heated, add the chicken and onion to the pot. Sauté for 4-5 minutes, stirring once or twice, until onion is soft and chicken is beginning to brown. Pour the sauce mixture into the pot and stir to coat everything well. Make sure that sauce is alllll up in that chicken's business! Switch the Instant Pot to the manual setting. Cook on high pressure for 10 minutes, with the top vent sealed. While the chicken is cooking, make your slurry for thickening: combine the 2 teaspoons of tapioca starch with the 2 Tablespoons of water, and whisk until smooth. When the chicken is done, do a quick release on your IP. Remove the lid, and turn the pot back on to sauté. Add the smooth slurry and stir. Sauté for 5-10 minutes until sauce begins to thicken. 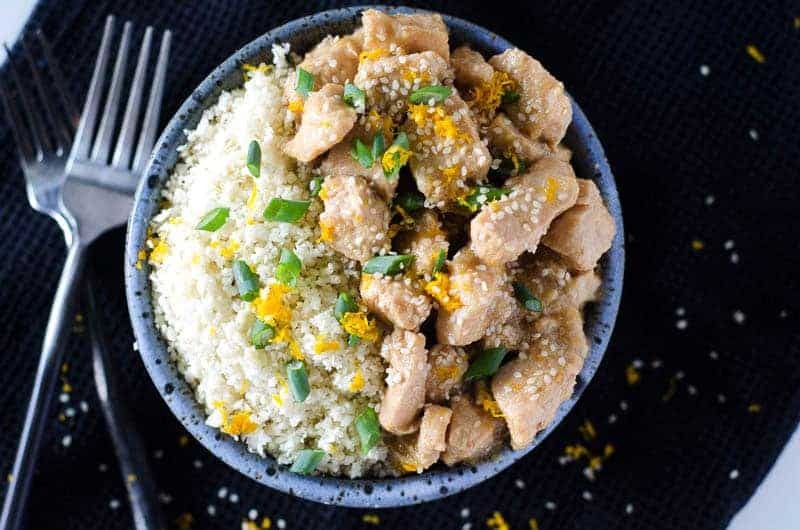 Turn off Instant Pot, remove chicken, and serve topped with sesame seeds and green onions. It's delicious over cauliflower rice!